No other brand embodies working-class Britain more than Dr. Martens. Born in post-war Germany but made in the United Kingdom, Dr. Marten’s has bounced its way through seventy years in the footwear business, becoming synonymous with youth, alternative music, and rebellion along the way. But who is Dr. Marten? And how did his bouncy soles find themselves stomping along to ska rhythms in London’s skinhead dancehalls and jumping off stages in Seattle’s grunge scene? The Dr. Martens story begins in 1945. Dr. Klaus Maertens, a twenty-five-year-old soldier, had returned to Munich after the second World War nursing a broken foot. Finding the generic leather-soled footwear too harsh during his recovery, Maertens made an air-cushioned sole that would provide more cushioning and traction. Using a needle and a salvaged cobbler’s last, Maertens fashioned a prototype shoe and presented it to his former classmate Dr. Herbert Funk, a mechanical engineer. The duo became business partners and began using discarded rubber and other disused military supplies to produce their innovative footwear. Maertens and Funk began formal production in 1947 and watched their business grow rapidly over the next decade with their cushioned soles proving highly popular among housewives and older women. By 1959, Maertens and Funk had begun looking to expand their business overseas, advertising their unique footwear in magazines across Europe. Over in England, the Griggs family had earned a solid reputation for making sturdy shoes and workboots in the small town of Wollaston, Northamptonshire for over fifty-five years under the name R. Griggs Group Ltd. While scanning a shoe-trade magazine, Bill Grigg—a third generation Grigg running the family business—noticed an advertisement for Dr. Maertens air-cushioned sole unit. Grigg reached out and obtained a license to produce work boots using the Dr. Maertens’ cushioned sole. Grigg adapted the design of Dr. Maertens’ footwear—adjusting the heel to improve the fit, adding a rounded bulbous upper, and introducing the now-trademark contrasting yellow stitching—and re-branded the sole unit as Airwair. Anglicising the creator’s name, Grigg introduced Dr. Martens’ footwear to the U.K. in 1960 with the now-legendary 1460 eight-hole boot. Premiering in smooth, oxblood leather, the 1460 boot was manufactured in the R. Griggs Group Ltd. Northamptonshire factory which is still in operation today. Other manufacturers in the Northamptonshire area produced batches of footwear under license from Dr. Maertens, most notably Northamptonshire Productive Society (NPS) who went on to become Solovair in 2006, another English shoemaker who produce footwear that mirrors the design and construction of Dr. Martens. However, The Grigg Group Ltd., armed with their trademark yellow stitching, Airwair branding, and signature heel loop, was the most prolific manufacturer of Dr. Martens. Initially sold as a £2 work-wear boot, Dr. Martens became popular among postal workers, factory workers, and police officers. But when the skinhead sub-culture arrived in England, Dr. Martens boots became a part of the skinheads working class uniform. 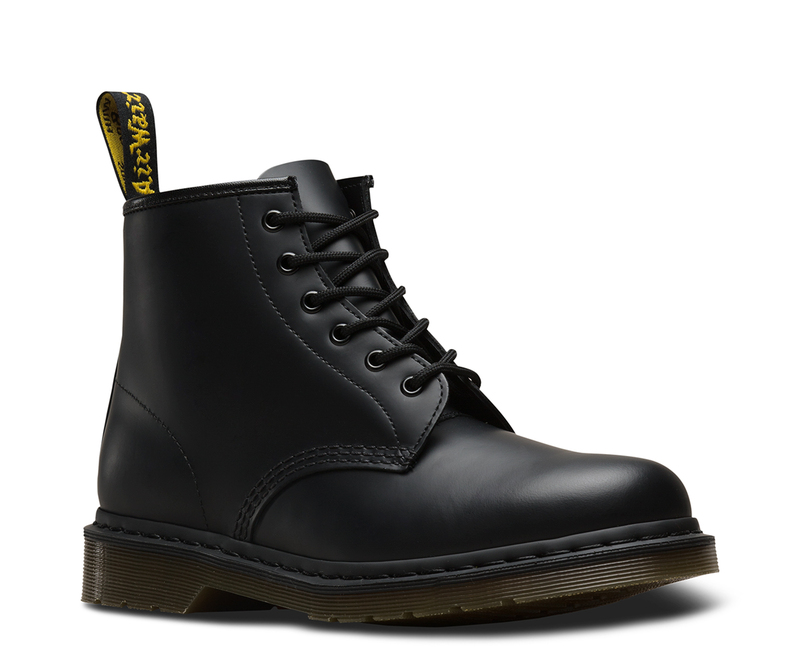 The eight-hole 1460 boot was often paired with jeans or sta-prest trousers and button down shirts and soon became a symbol of skinhead culture. By the late-seventies Britain had already seen the death and revival of the skinhead movement, and the beginnings of glam, two-tone, goth and new-romantic, and punk rock. Each of these new genres conjured tribes of rebellious youths eager to express themselves and the robust 1460 boot—known simply as ‘docs’ or DMs’—was the boot of choice. By the mid-eighties, Dr. Martens had become a recognized symbol of British youth culture and the working class. The austerity and social reform proposed by the Conservative party caused even more rebellion and youth unrest in England. Alternative music scenes raged on and American punk bands touring the U.K. would buy Dr. Martens bring them back to the States. This placed Dr. Martens in prime position to be swept up in the Seattle-based storm that was Grunge, a new genre of alternative music that birthed bands such as Nirvana, Melvins, Pearl Jam, and Alice in Chains. Heavily worn Dr. Martens boots worked perfectly with the ‘loser-kid’ aesthetic of many grunge acts, sustaining the boots popularity through the nineties. Dr. Martens was highly profitable in the nineties, with a six-story department store in London’s Covent Garden and a production line that manufactured over ten million pairs each year. However, sales eventually dipped after the turn of the millennium, with profits plummeting so low in 2003 that Dr. Martens began flirting with bankruptcy. These tough times saw Dr. Martens cut over a thousand jobs in the U.K. and relocate production to China and Thailand to save money. Although this move defied Dr. Martens’ philosophy of British-made boots made in the heart of the English midlands, it formed a major part of a complete company reform that saw Dr. Martens survive and The R. Griggs Group Ltd. honored with an award by Institute for Turnaround for conducting such a successful restructure. Dr. Martens is now going strong after a surge in sales in the early 2010’s. The brand is sold in hundreds of stockists worldwide and has standalone bricks-and-mortar stores all over. In addition to their timeless styles, Dr. Martens produces industrial work boots with steel toes and specialized sole units, and the brand has collaborated with a multitude of designers and labels such as Yohji Yamamoto, Nepenthes, Supreme, and A Bathing Ape. Dr. Martens also has special collections such as The Vintage Collection that focuses on reproducing Dr. Martens to look how they would have in the sixties, and the Made in England Collection that builds Dr. Martens to the highest quality in the original R. Grigg Group Ltd. factory in Northamptonshire where the first Dr. Martens boot was produced in 1960. These collections, however, only account for 1% of Dr. Marten’s production, with the other 99% being manufactured overseas. How are Dr. Marten’s made? Dr. Martens’ perennial association with the working class has demanded high-quality footwear and the brand has stayed true to its roots by keeping production methods simple and sturdy over the years. Up until recently, Dr. Martens offered a ‘Made for Life’ line of footwear with each piece coming with a lifetime guarantee. What makes Dr.Martens so durable is the PVC sole unit. As well as being oil and acid resistant, the PVC sole will soften with wear, reducing the risk of cracking or splitting. These sole units also have a grid-like construction that traps air when applied to the boot, providing the cushioning support that gives Airwair its name. To apply this sole, a PVC welt is stitched onto the upper. The PVC sole unit is then bonded to the welt with extreme temperatures to form one solid, sturdy PVC unit. Any excess produced from melting the welt and sole unit together is then buffed down with a grooved buffer, which is what gives the sides of Dr. Martens soles the grooved finish they are known for. The original 8-eye boot that started it all. The 1460 is Dr. Martens’ calling card and the construction of this boot has remained almost untouched since the sixties. The smooth leather upper is seen here in the iconic black colorway sat upon the all-important air-cushioned PVC sole which has been affixed with archetypal contrasting yellow stitching. Each pair is finished with branded Airwar pull tabs and gold foil printed Dr. Marten’s branding on the insole. Available $140 at Dr. Marten’s. This three-hole shoe is another classic from Dr. Martens. Often chalked off as a ‘low’ version of the 1460, the 1461 is actually constructed quite different with much less stitching on the vamp and no stitching on the heel counter. It does, however, feature the archetypal PVC sole unit and contrasting yellow stitching. It is this style that was donned by British postal workers throughout the sixties and seventies thanks to the balance of clean minimal aesthetic and robust construction. Available for $120 at Dr. Martens. As a six-hole boot, the 101 sits just below the ankle for those who don’t want to go for the full eight-hole height. 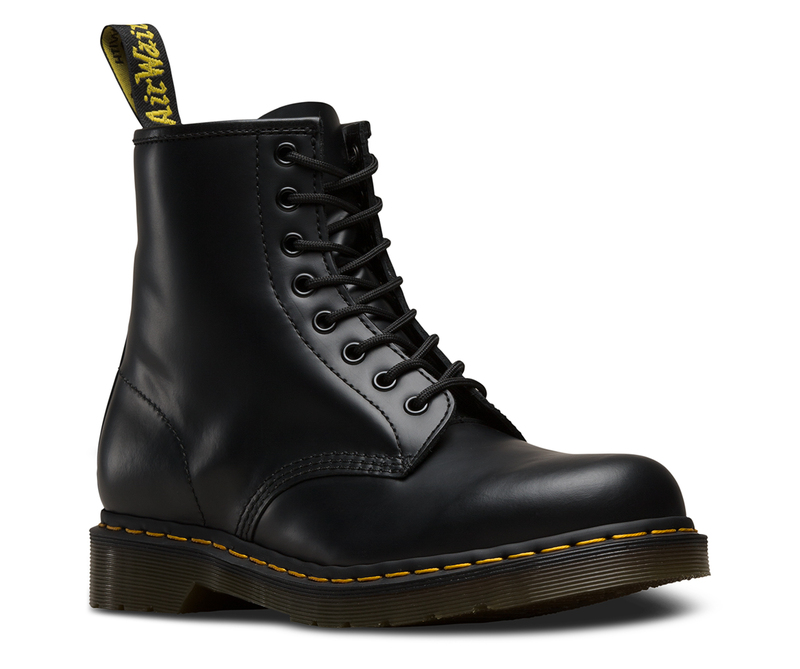 The construction is almost a carbon copy of the 1461, but the yellow welt stitching is swapped for tonal black stitching to match the more understated aesthetic of this particular Dr. Marten’s boot. 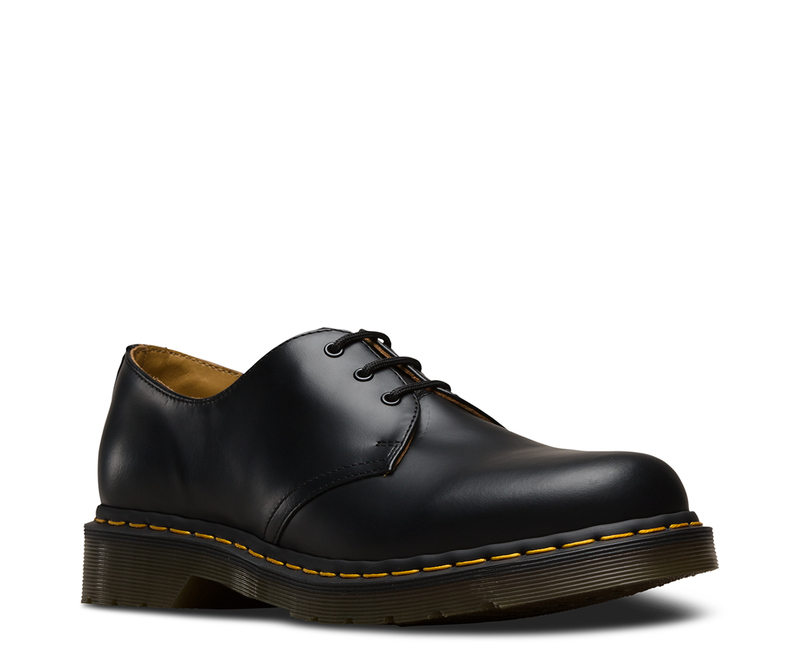 Available $135 at Dr. Martens.